Rayavadee Reservations. Call 020 7962 9933. 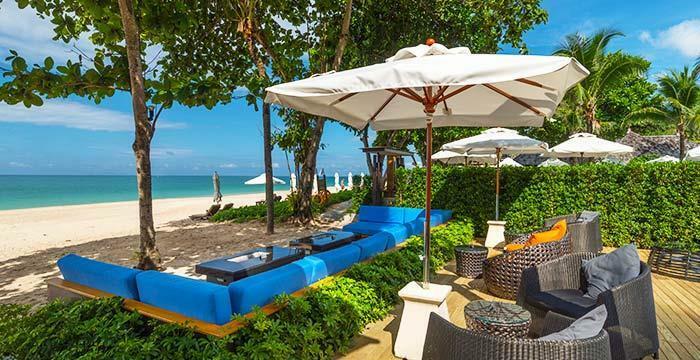 This luxury holiday raises the bar when it comes to island hopping adventures in Thailand and includes a stay at some of Thailand's finest beach hotels. Start with 4 nights at 5* Rayavadee in Krabi before being whisked away for some more 5* papmering at Layana Koh Lanta. From here it's on to Phuket, staying 7 nights at The Slate Hotel. Rayavadee is set on a stunning peninsula overlooking the Andaman Sea in Thailand's southern Krabi province. Close to Phuket, it's the perfect base for exploring this corner of the country and combines luxurious accommodation and amenities to be included as one of the Leading Hotels of the World. The Rayavadee resort has 98 enchanting two-storey pavilions and four luxurious private villas, all spread over 26 acres of coconut groves and tropical gardens and bordered by three beaches. 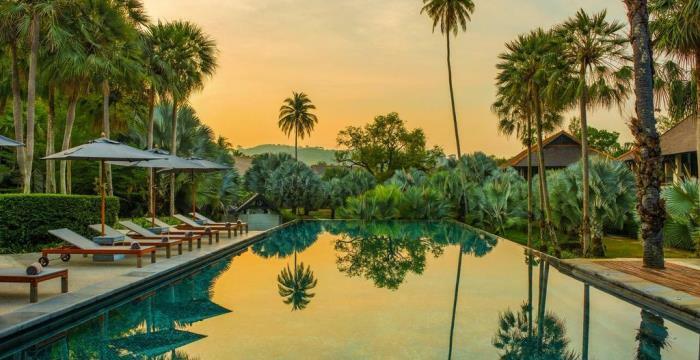 Award-winning architecture blends with stylish yet tropical-style interiors to echo the natural surroundings and traditional Thai villages. Rayavadee's Activities Centre offers a full range of excursions to Krabi's most interesting sites as well as trips aboard luxury speedboats to the surrounding islands. At the resort itself, guests can enjoy water sports such as canoeing, snorkelling and wind surfing, while the fitness centre is open daily, along with tennis and squash courts. Raya Dining at Rayavadee offers international cuisine in an elegant yet informal setting, while Krua Phranang is reached by a stroll along a moonlit path, where you can then enjoy a classic Thai dinner by the sea. Raitalay Terrace offers a Mediterranean menu in a beachside setting, while the aptly named Grotto nestles under an ancient limestone cliff, the perfect setting for a leisurely lunch and cocktails. I wouldn’t recommend using BA on this route (Heathrow - Bangkok). Their service was awful, the crew were offhand and lazy (almost 10 hours between services on the return leg) and the aircraft were old, out of date, cramped and uncomfortable. DialAFlight did well, BA were rubbish. Always great service from Saf who has been my 'go to' contact for holidays for the last 6 years. Never let me down and even has the forethought to call me the day before we leave to wish us a good holiday. How many other tour companies would do that! As usual, everything excellent, thank you! Excellent service as always. Definitely will use DialAFlight again. Always efficient and friendly service. Don’t waste time booking with anyone else everything was so smooth. Brilliant, thanks. This is the first time I have used DialAFlight following recommendation. Communication has been great either via a phone call or the phone app. All connections were great. Always there waiting ahead of time with smart drivers & clean cars. Water was always provided. I will be contacting you again soon for my next holiday to The Maldives. Thanks to Ted for a great job. As always, great service from yourselves and will continue to use DialAFlight and refer friends and family to you. I’ve been using you for my years now -always a good service, always helpful. Apart from minor problem with seat reservations (badly separated) on outbound flight, which we rectified on the plane, everything went splendidly with DialAFlight efficiency and friendly helpfulness. Absolutely fabulous holiday. Great location, wonderful people. Superb. All flights, transfers and staff on time, extremely polite. Would most certainly recommend. I have recommended DialAFlight and will continue to use your expertise for as long as I fly. Matt was excellent, helping me sort out flights. Fantastic hotel at Koh Lanta. The Warwick in Doha was pretty good but is currently surrounded by building work and because the traffic in Doha is so conjested the location was not ideal and it took a long time to get to the main tourist area.